Our return to making briefcases has created a supply of leather pieces just right for shoulder bags. Cutting only large briefcase panels from hides is a very inefficient use of leather hides. Economics demanded we produce something else. Thus, we present the return of our classic styles from our old shop. Below find our first offering. Depending on the response, we might add more styles. 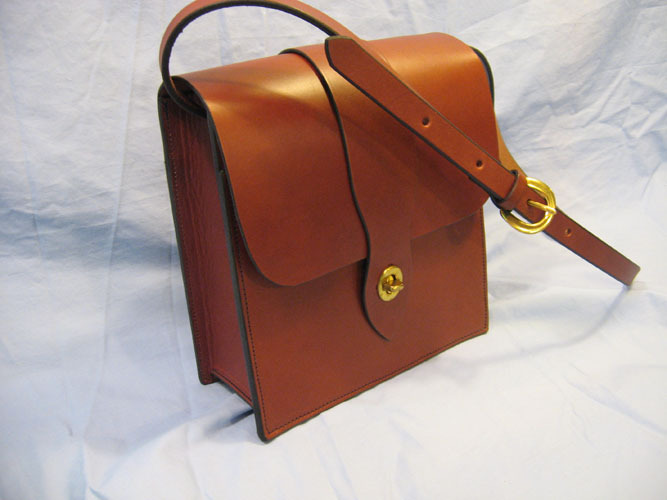 This extremely durable bag is made of the same "English Bridle" leather from Wickett & Craig (www.Wickett-Craig.com) of Pennsylvania used in our briefcases and belts. We use a thinner lighter 6 oz weight version in the cases and bags. Although the shoulder strap itself is full 8 to 10 oz weight belt leather. In addition to the main large section there is a flat pocket against the inside back panel and a flat pocket on the front panel under the flap. More photos available. Hardware is solid brass. Can be made using nickel/brass hardware. Size 8 ¼"L to R, 3 ½"F to B, 9" high. Strap drop adjustable 17" to 20" (can be made to your spec).